Your store just closed, you received more orders than you could have hoped for, and the group was more than pleased. But now comes the fun part: decoration and fulfillment. Our new Work Orders tool makes this part of the job less taxing and more efficient than ever before. Handwritten work orders are a thing of the past and we're excited to launch this brand new feature. Work order forms often make the most sense to the person who wrote them. The new Work Orders tool allows you to create a report that clearly defines your decoration requirements and instructions in a way that makes sense to everyone. 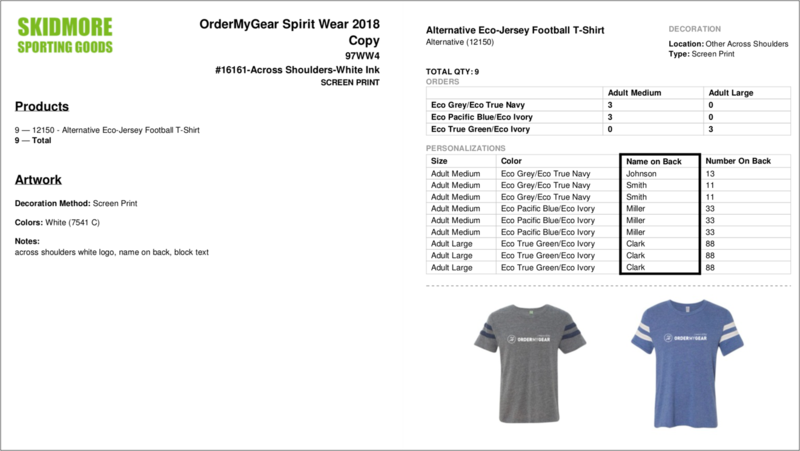 You can easily create work orders and assign them to each of the products in your store resulting in a well-organized PDF that displays the decoration and personalization instructions, product quantities, and product images. You no longer have to cross-reference multiple reports in OrderMyGear to figure out what needs to be decorated. Creating a work order in OrderMyGear reduces time and hassle significantly. This powerful and dynamic tool also helps you communicate with your decorator in a consistent format that they can understand. As always, we love your feedback. Send any thoughts and ideas about Work Orders to product@ordermygear.com.